My children have a few favorite books they love to read over and over again. The exclusive list includes Elmer, Corduroy, Bear Snores On (and all the Bear books by Karma Wilson), Pete the Cat, and the classic Madeline. 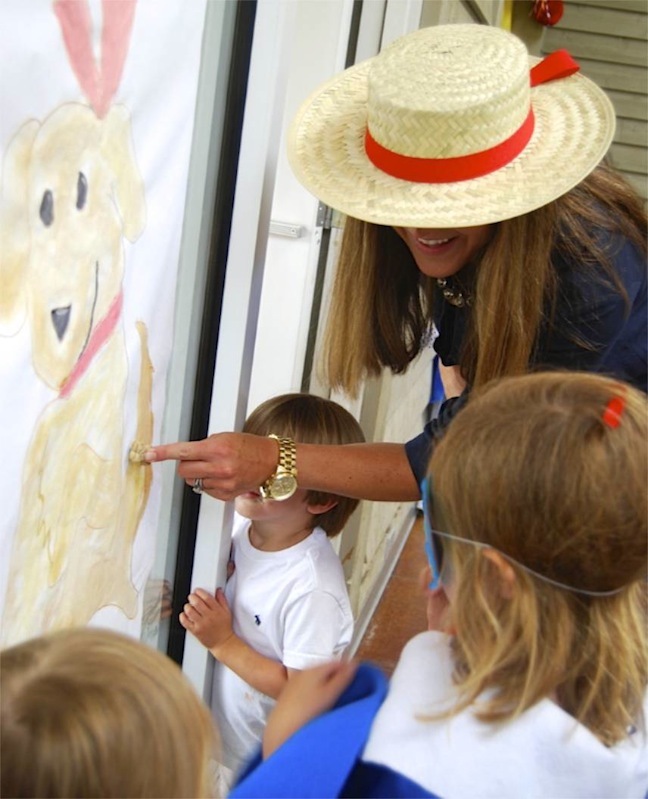 The Parisian schoolgirl who wore the blue cape and signature hat captured our minds and hearts in the timeless Madeline children’s books. 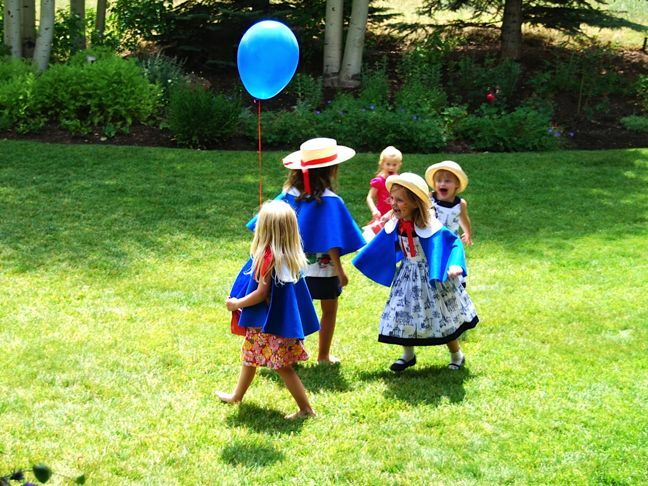 Well, this Madeline party captured my party-throwing spirit! Partied fifteen girls who painted and ate candy, too. 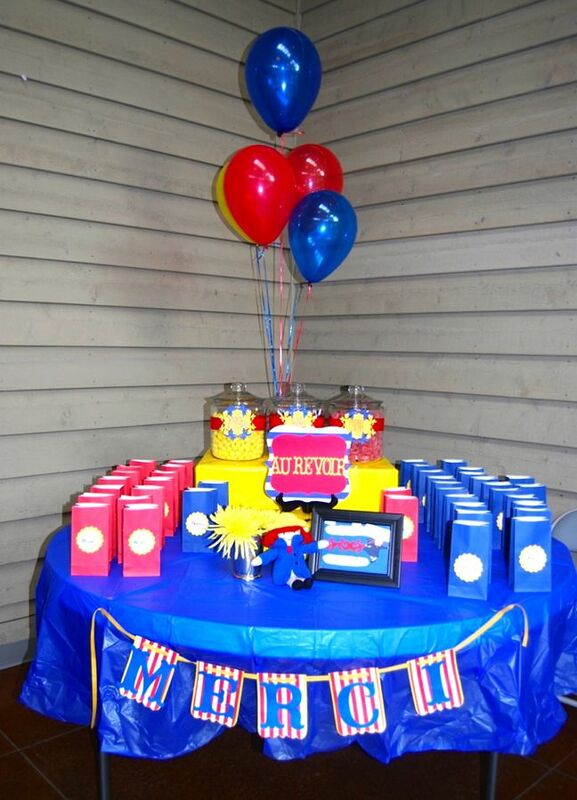 Then ate a Madeline birthday cake! 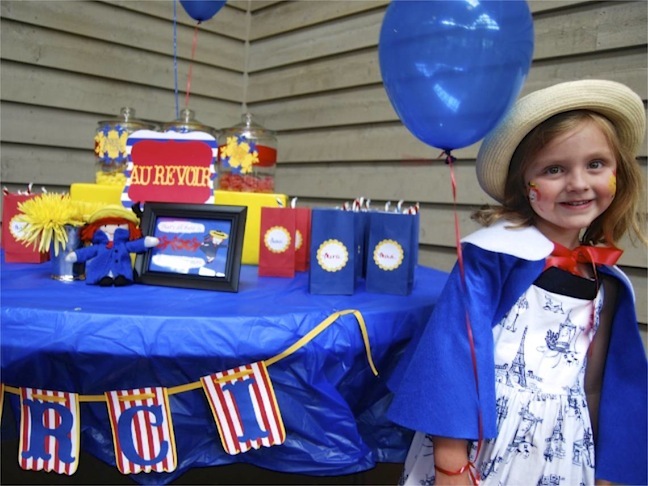 My good friend Atlanta shares how you we host our own memorable Madeline party. 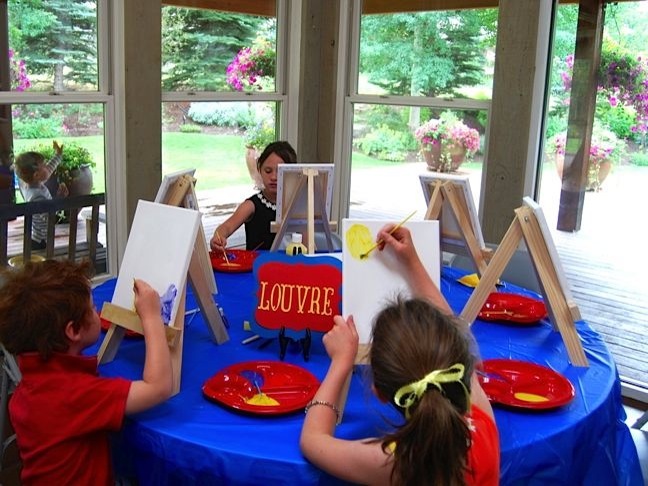 Set up an art station: A mini Louvre is definitely in order for a Parisian-themed party. 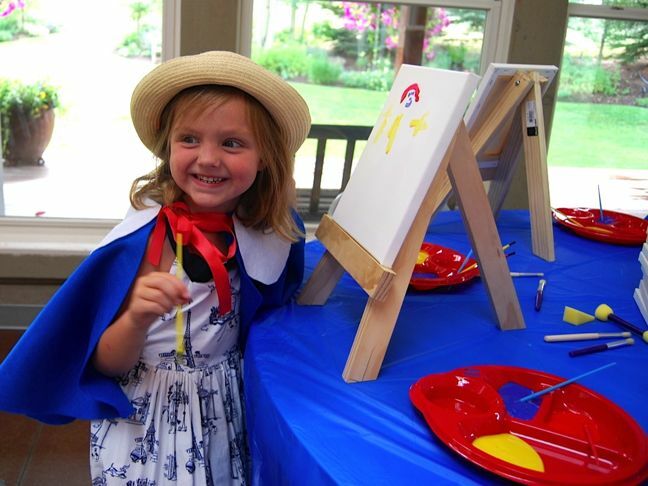 Set up mini easels and canvases, along with paint and paintbrushes, and let their inner Picassos come out. 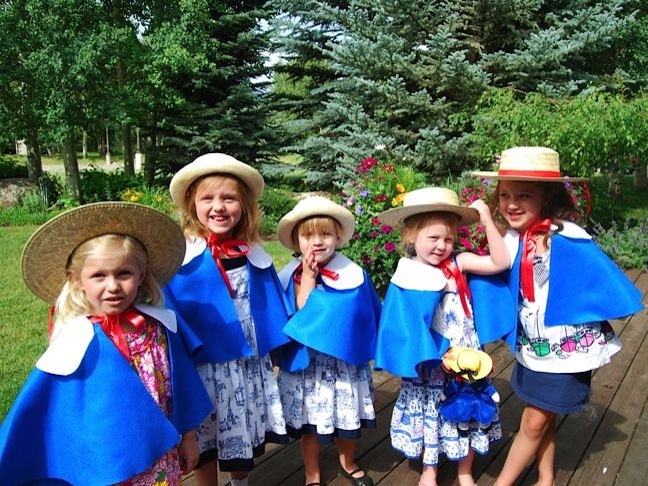 Set up a shoppe: Madeline was a Catholic schoolgirl who always wore a blue cape, a yellow hat with a black hatband, white socks, and Mary Jane shoes. 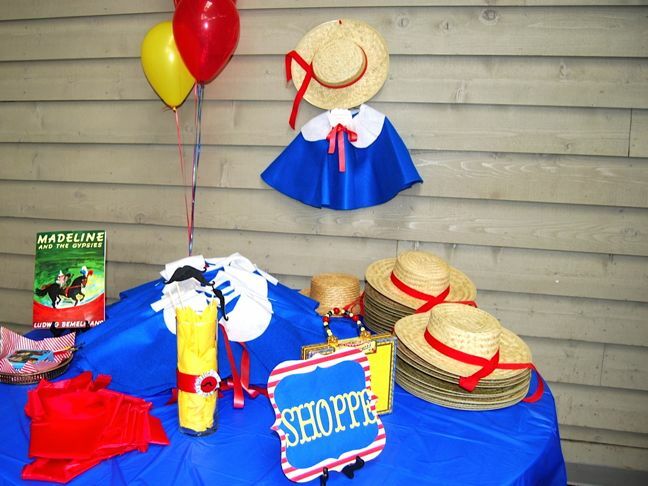 One of the hits of the party was the Madeline shoppe I set up for all the girls, so they could play the part of Madeline. 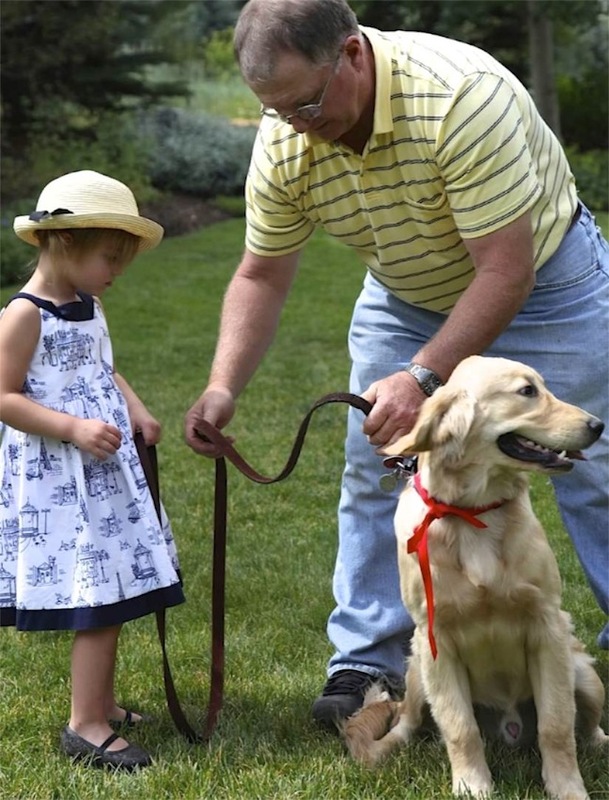 Play give the dog a bone: A friendly dog rescues Madeline in the book Madeline’s Rescue, and the dog became known as her dog. In the book it reads,The dog loved biscuits, milk, and beef. And they named it Genevieve. I had a real Genevieve make an appearance, and played a “give the dog a bone” game for some extra laughs. 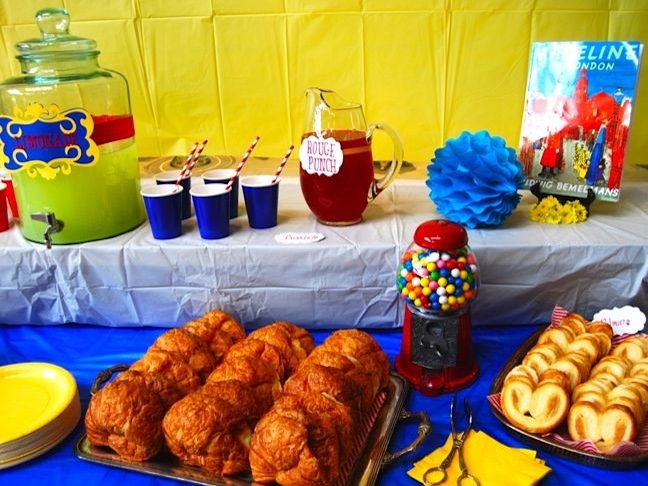 Serve Parisian-inspired food: My goal was to serve simple, Parisian-inspired food all the kids would eat. 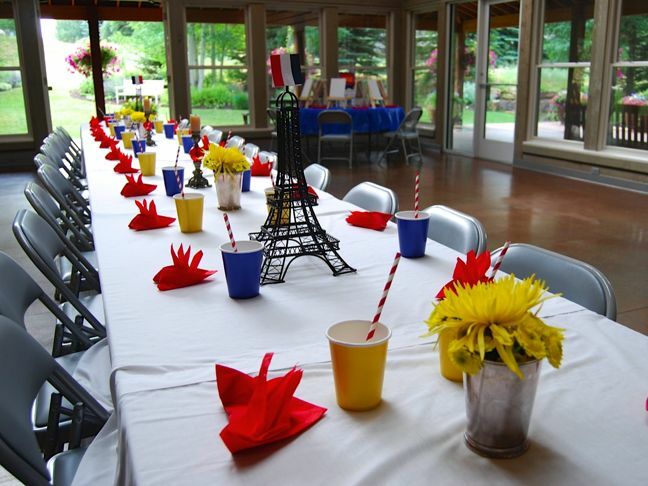 I served Madelines, croissants, strawberries and cream, and colorful drinks. 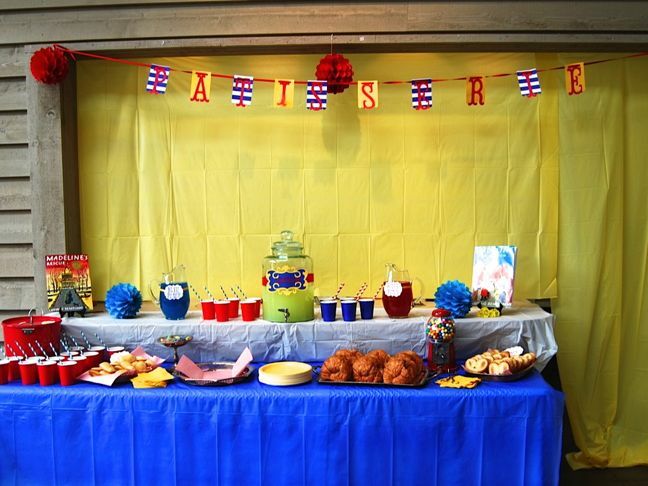 For the set-up, I bought cheap plastic tablecloths for the backdrop and table cover, then decorated them with red poms, Madeline books, and colorful straws and cups. 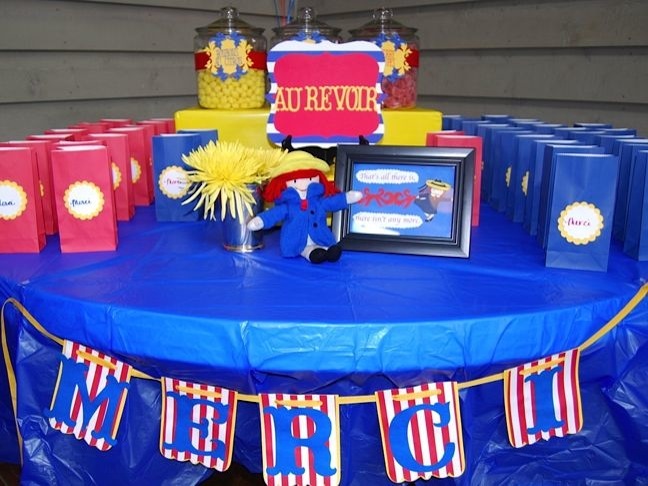 Say “au revoir” and “merci” with something sweet: Kids love sweets, so I set up a candy buffet with red, yellow, and blue candy for kids to take home in their own goody bags. 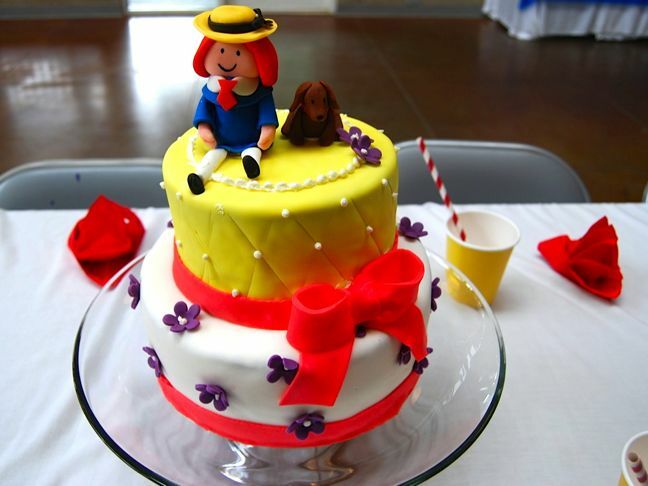 We blew out candles on a custom-made cake for the special birthday girls, topped with a fondant Madeline and dog, Genevieve. Incorporate the Eiffel Tower: The book series takes place in Paris, France. And the most obvious symbol of Paris is the Eiffel Tower. 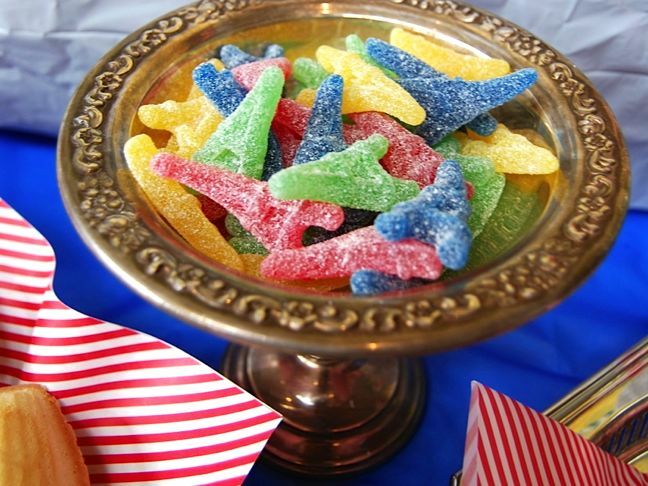 I placed an Eiffel Tower centerpiece along the long dining table and served mini Eiffel Tower shaped gummy candies. 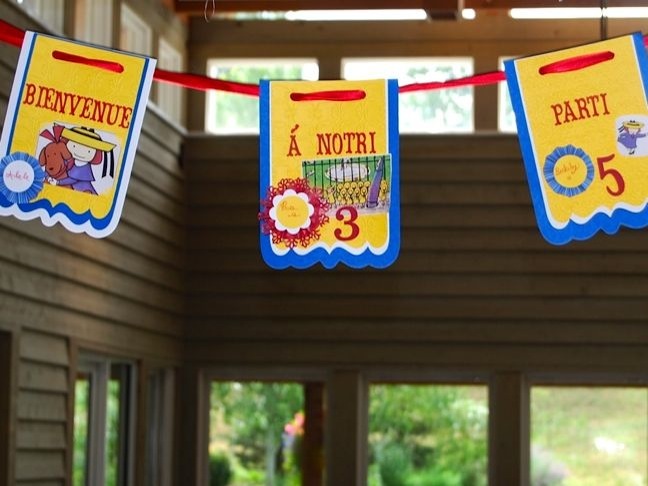 Add some Parisian flair: Make French signs, such as merci (thank you), au revoir (goodbye), and bienvenue (welcome). 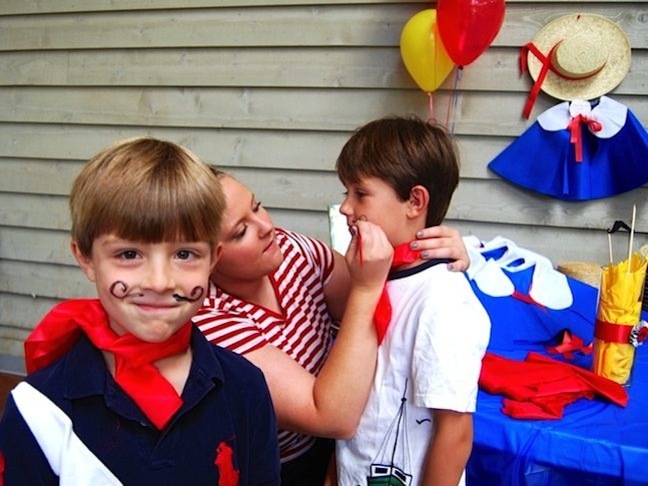 And don’t forget about the Parisian mustache for the little men at the party. 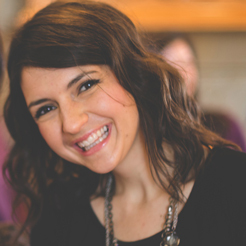 You will not need a professional face painting artist for this—an aunt, uncle, or friend will do just fine. 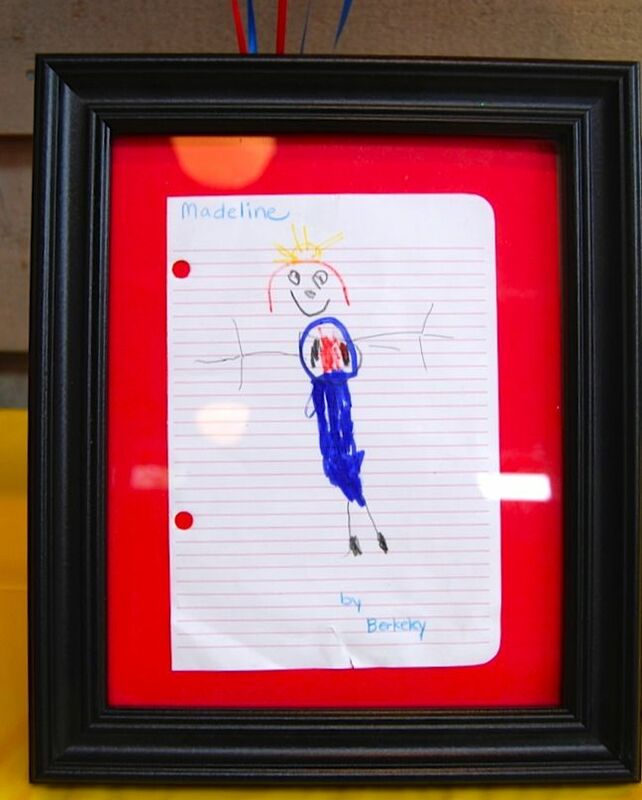 Add little details from the book: A signature detail from the Madeline books is her red suitcase. 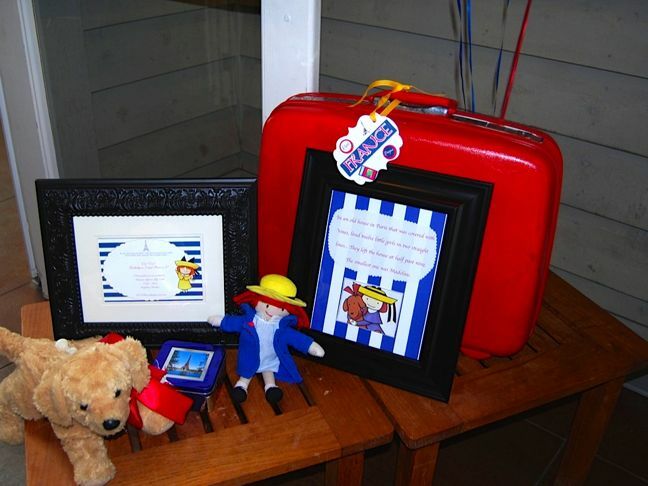 I used a red suitcase for an entry prop, along with a doll Madeline, the invitation, balloons, and a stuffed animal dog. 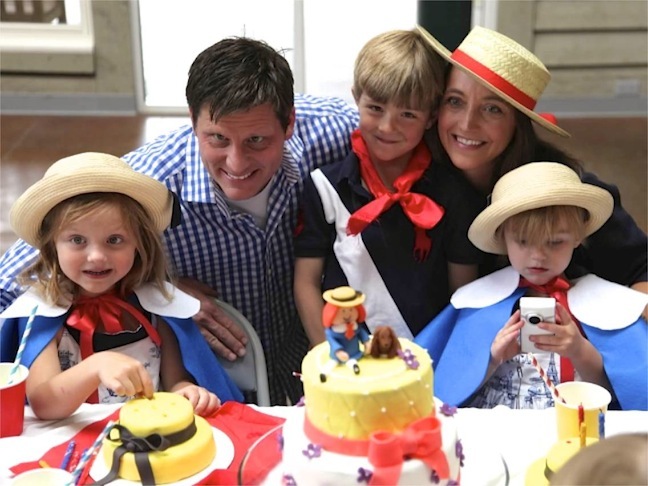 I incorporated red, yellow, and blue colors throughout the party for pops of color, and because those colors were meaningful in the book—red (Madeline’s ribbon), yellow (Madeline’s hat), and blue (Madeline’s cape). 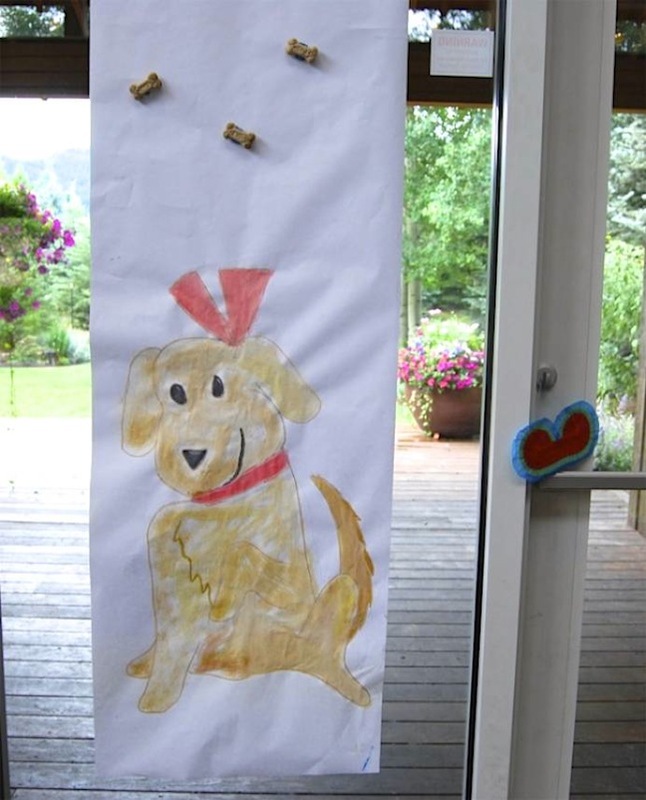 There’s nothing cuter than children’s artwork, so I proudly displayed my daughter’s Madeline artwork for everyone to see. 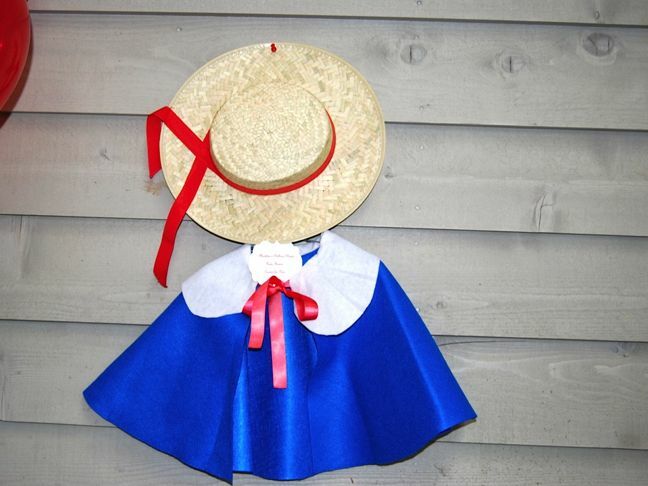 Lived twelve little girls in two straight lines. And brushed their teeth and went to bed. In two straight lines in rain or shine.